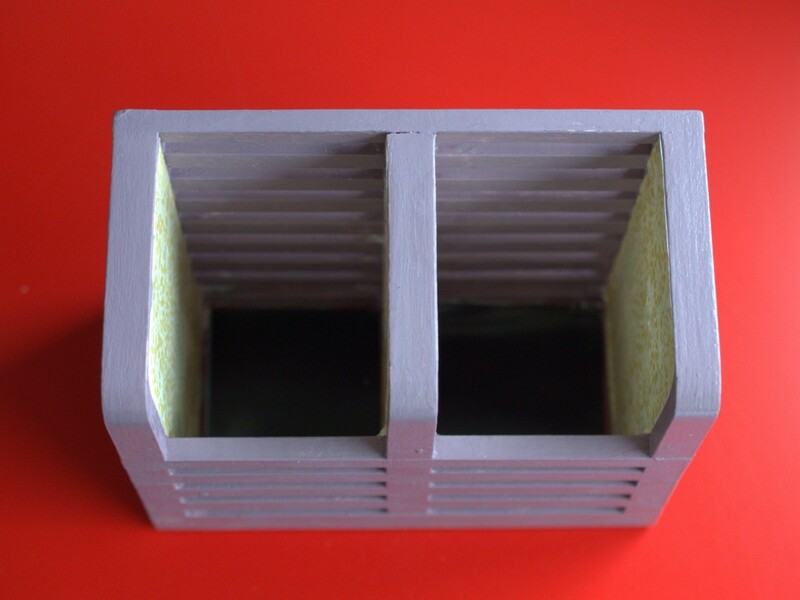 The intended use for this particular object is to hold cutlery on a dish rack. And that’s what we used it for until we moved to our current place. 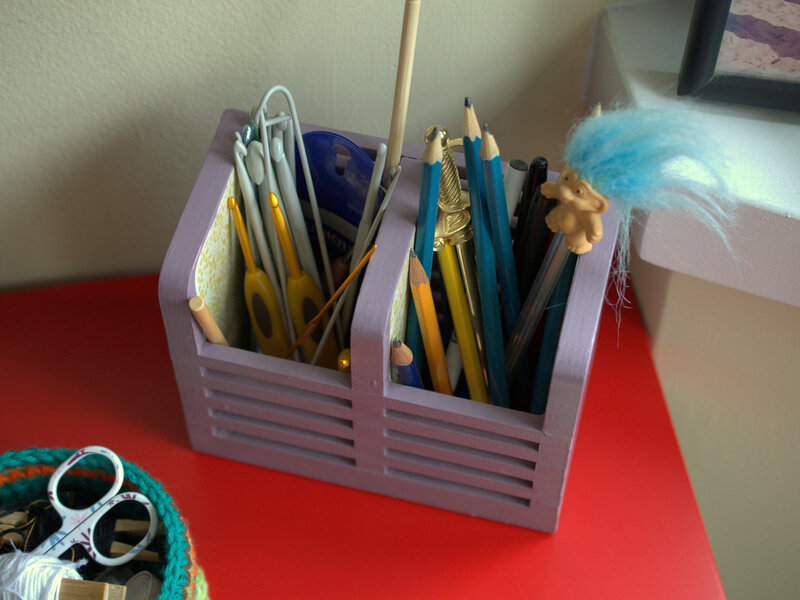 Then its purpose was to hold all my pens and pencils and it was doing an amazing job until one of the slats came off! I guess it had reached maximum pen and pencil capacity. But instead of tossing it out I decided to glue the piece back because I really liked the look of it and wanted to keep using it. And, because I knew all my pens and pencils would only break it again I decided to use it to hold my crochet hooks and (a few) pencils/pens. After fixing it I realised how bland it looked, how plain, how…naked. Something had to be done and before I could change my mind I brought out paints and sponges and brushes. 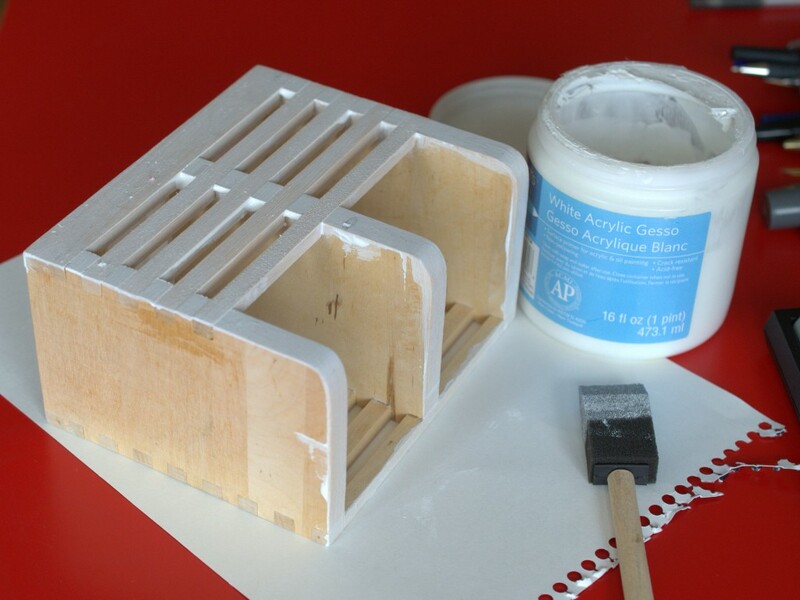 First, I used white acrylic gesso to prime the surface. 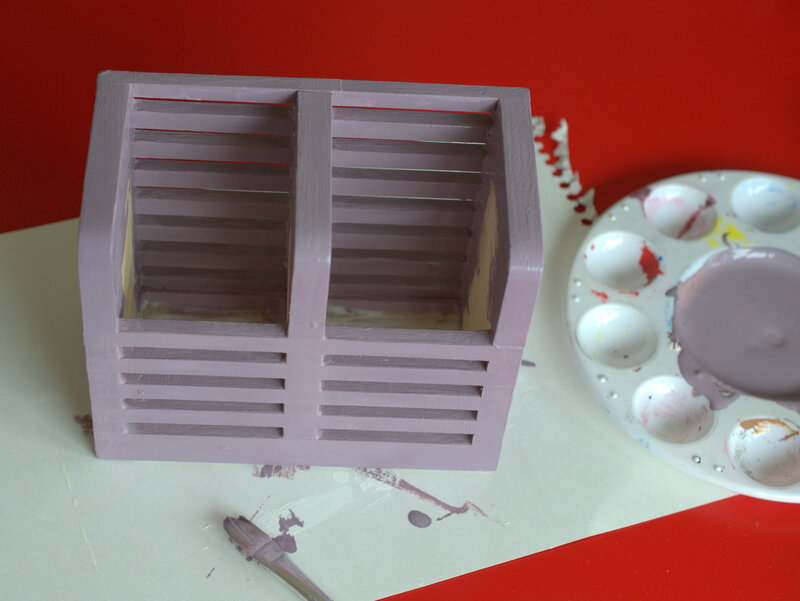 Once dry, I painted the container with acrylic paint in a soft mauve. I didn’t completely paint the inside walls so I could glue some pretty printed paper. 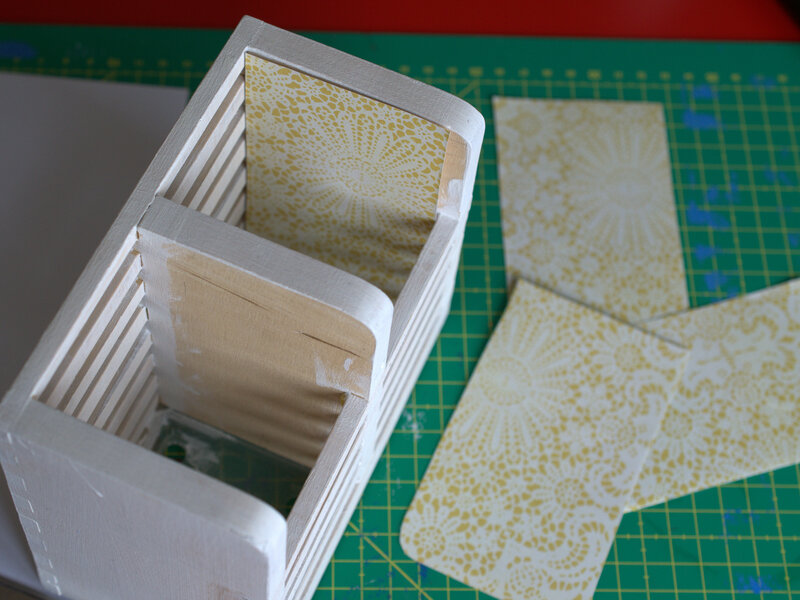 Finally, I applied a light coating of Mod Podge over the paper and entire container, but especially near the paper edges so they won’t peel with the constant hook and pencil movement – sometimes I can be a little careless in putting away hooks and pencils. 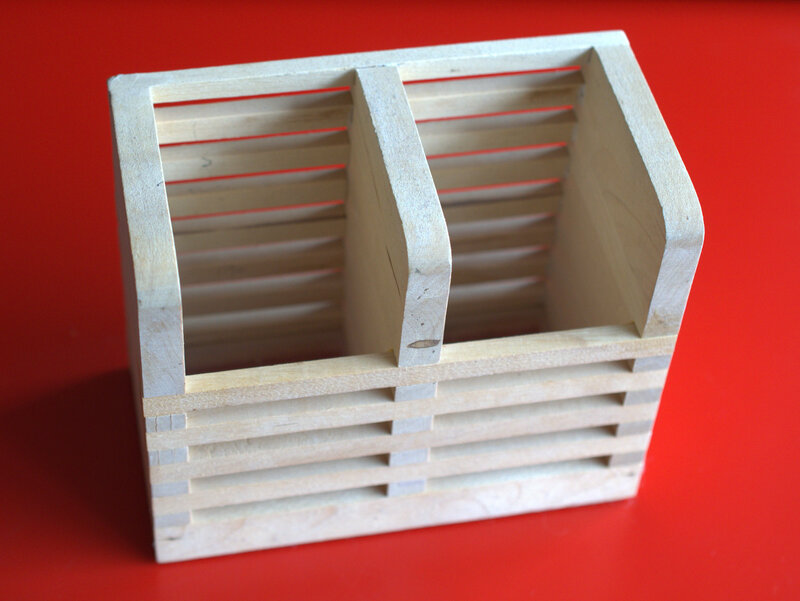 And speaking of hooks and pencils, the bottom of this particular container had holes in it so I placed a square piece of card stock in each compartment. The last thing I need is for my hooks to slip through the gaps. 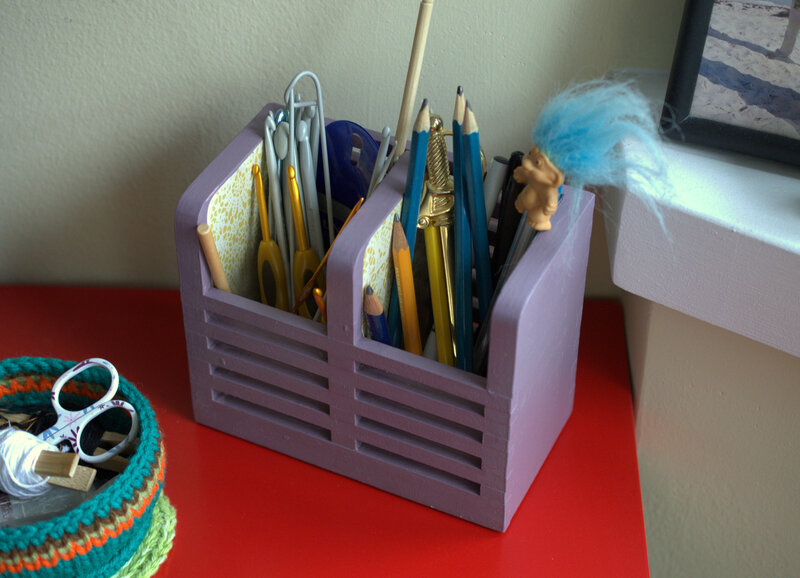 And now I have a “new” crochet hook (and pencil) storage! My favourite part about having storage for both hooks and pencils is that I tend to move back and forth between the living room and office, always having to make several trips because I forget a hook or a pencil. But not anymore! I hope you’ve enjoyed this post and have found some inspiration for that random object you’ve been wanting to makeover!